"Good Shepherd of the Lost Sheep in America"
In the last decades of the nineteenth century, America received into her open arms a steady flow of immigrants from the Middle East. Known generically as "Syrians," many of these immigrants, Orthodox in faith and Arab in culture, left their ancestral towns and villages to seek new and brighter horizons for themselves in the New World. As their numbers increased in America, so too did their need for spiritual leadership. Although we do not quite know how, these struggling new Americans learned of a young, pious Syrian priest, Father Raphael (Hawaweeny), at the time an archimandrite and professor of Arabic language at the Kazan Theological Academy in Imperial Russia. Through the auspices of their lay leader, Dr. Ibrahim Arbeely, they contacted the young priest with the request to come to America to be their shepherd and spiritual father. Several themes emerge as the story of St. Raphael's life unfolds. The first is the mysterious way in which God led him from his native homeland to the shores of the American continent. The second is his submissive attitude to the providence of God. And the third is his love for the people of God. Though during his lifetime he was neither a wonder-worker nor a clairvoyant elder, St. Raphael embraced a life of total abandonment of self for the service of God and his fellow man: a life of true spiritual asceticism. His message for us as we approach the end of the twentieth century is as simple and profound as the Man who first uttered it: "if anyone would come after Me, let him deny himself and take up his cross and follow Me" (Matthew 16:24). St. Raphael reveals for us the royal path to salvation. He did not seek honor for himself. What is most striking is the total lack of concern for self which is evident through his life and ministry. He followed his Master. Whatever the cost, whatever the price, he followed. However heavy the Cross, however few the rewards, he followed. A brilliant man, capable of conversing in several different languages and educated in both Greek and Russian theological schools, St. Raphael does not strike us primarily as a deep thinker or theologian, but as a good shepherd who laid down his life for his sheep. His writings and his sermons are eminently practical, based on Holy Scripture and his own experiences of life. He followed Christ. In the words of the Prophet Isaiah, devoid of any personal agenda, he simply said at every time and in every place: "Here I am, send me" (Isaiah 6:8). Bishop Raphael, Archbishop Platon of the Russian Archdiocese, and Bishop Alexander of Alaska, hierarchs in North AmericaHe exemplifies the image of a truly traditional Orthodox bishop. He received the faith from his forefathers and he sought faithfully to hand that faith over to his spiritual children. He was a great man of prayer. He loved and lived the liturgical life of the Church and it was his spiritual support. He was not an innovationist; he did not "change" anything. He brought to his pastoral work no agenda other than to be faithful to the charge which he had received. It was the people he served who consumed his every thought and every scheme. How to reconcile enemies? How to restore the lapsed? How to raise the children? How to plant a mission? How to educate a priest? The legacy of his accomplishments is outstanding: he founded thirty parish churches, authored or translated fourteen books, including both the Small and the Great Euchologion, founded St. Nicholas Cathedral in Brooklyn, created and authored many articles in The WORD, etc. But these accomplishments do not reveal the true sanctity of his soul nor do they give us the measure of the man. These are to be found rather in the lives of the people he led to Christ and His Church. The thousands who attended his funeral and paid their last respects all recognized in St. Raphael the image of the God he loved and served. Like his Chief Shepherd, St. Raphael laid down his life for his sheep. Like the great pastor, the Apostle Paul, he made up in his body that which was lacking in the sufferings of Christ (Colossians 1:24). He was not a hireling; having loved his own, he loved them to the end. It is this love which united him to God and it is this love which unites him to us, his spiritual children. It is this love which sanctified him and it is this love in which he dwells in the heavenly Kingdom. The words of our venerable and God-bearing Father John Climacus find their embodiment in St. Raphael: "Love grants prophecy, miracles. It is an abyss of illumination, a fountain of fire, bubbling up to inflame the thirsty soul. It is the condition of angels and the progress of eternity." St. Raphael was born on or near the Synaxis of the Archangels, November 8, 1860, to pious Orthodox Damascenes, Michael and Mariam Hawaweeny. Due to the violent persecution of the Christians of Damascus in July, 1860, which saw the martyrdom of the Hawaweeny family's parish priest, the New- Hieromartyr Joseph of Damascus, and hundreds of their neighbors (all are commemorated on July 10), Michael and his pregnant wife Mariam fled from Damascus to Beirut. It was in that city that the future saint first saw the light of day. Indeed as the child's life unfolded, it was evident that he would have no continuing city in this world, but would seek the city which is to come (Hebrews 13:14). St. Raphael received his primary and secondary education in the parochial schools of Damascus, and his first theological training at the Oecumenical Patriarchate's Theological School at Halki in the Princes Islands [near Istanbul]. He later studied at the Kiev Theological Academy in Imperial Russia. During this time, the Syro-Arab community in the United States was growing at an increasing rate. A Syrian Orthodox Benevolent Society was organized in New York City and the president, Dr. Ibrahim Arbeely, contacted St. Raphael, then a priest, about coming to the United States. St. Raphael met with Bishop Nicholas in St. Petersburg and in 1895 returned with him to the United States to serve the Syro-Arab community. St. Raphael was placed in charge of the entire Syrian Orthodox Mission. He was assigned to New York City and organized the parish which later became St. Nicholas Cathedral in Brooklyn. He supervised the development of other immigrant communities, traveling widely through the United States in 1896 to organize parishes. By 1898, St. Raphael published an Arabic language translation of the Great Euchologion for use in his churches. Later in the same year, he was to be the ranking representative of the American Mission to greet St. Tikhon (Bellavin), the new diocesan bishop. At the Liturgy on December 15, 1898, he spoke of St. Tikhon's mission in his sermon. "He has been sent to tend the flock of Christ — Russians, Slavs, Syro-Arabs, and Greeks — which is scattered across the entire North American continent." St. Tikhon recognized his qualities and wanted St. Raphael to be one of his vicar-bishops in the reorganized diocese. In 1903, St. Tikhon went to Russia and asked the Holy Synod to approve his plan for the election of St. Raphael as his vicar-bishop. They approved St. Raphael's election and also consecrated Bishop Innocent (Pustynsky) as St. Tikhon's vicar-bishop for Alaska. 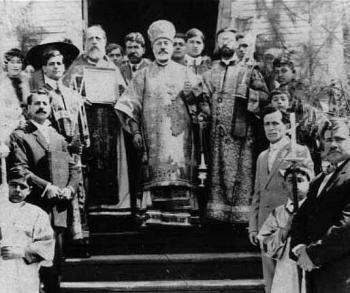 On March 12, 1904, the solemn rite of the election of St. Raphael as Bishop of Brooklyn was performed by St. Tikhon and Bishop Innocent at the Russian St. Nicholas Cathedral in Manhattan after the Vigil. The consecration took place the next day at St. Nicholas Church in Brooklyn, with St. Raphael making his Confession of Faith both in Slavonic and Arabic. Following his consecration, St. Raphael continued his work among the Syrian Orthodox and also helped St. Tikhon and his successors to administer the North American Mission. 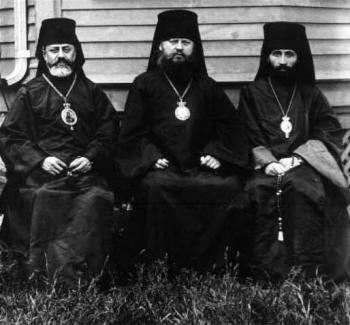 St. Raphael presided at the Clergy Conference held in Old Forge, Pennsylvania, on August 2, 1905, in the absence of St. Tikhon. He also consecrated the grounds of St. Tikhon's Monastery in South Canaan, Pennsylvania, the first Orthodox monastery in the New World. He founded The Word Magazine in 1905. After twenty years of service in North America, St. Raphael fell asleep in Christ at his residence next to his cathedral on Pacific Street in Brooklyn on February 27, 1915. At the time of his repose, he administered thirty congregations with 25,000 faithful. While St. Raphael is remembered by historians as a learned theologian, gifted missionary, prolific translator and writer, and the first to be consecrated to the sacred episcopacy in the New World, in popular piety and devotion his memory is cherished as an icon of the good shepherd who collects a scattered flock, leads his lambs to a safe and verdant pasture and ultimately lays down his life for them. Tales abound about St. Raphael's tireless ministry as a mediator and peacemaker, a support for the infirm and aged, an encouragement to the young and disheartened, a protector of widows and orphans, a defender of the dispossessed and the poor. The scope of his self-sacrificing pastoral ministry is preserved and revealed in his own meticulously kept handwritten missionary journals, which detail his transcontinental travels to countless cities, villages, isolated farms and ranches in the United States, Canada and Mexico. The following vignette offers a perfect illustration of why he is known as "the good shepherd of the lost sheep in North America." Once, on the return trip to New York from a grueling cross-country missionary journey, St. Raphael arrived by train in a Midwestern town late one evening and, carrying his own luggage, quietly made his way to a nearby hotel to await a connecting train early the next morning. Physically exhausted from several months of travel and living out of suitcases, St. Raphael found himself in the unique circumstance of not having the name or address of a single contact in the area; thus he could, at long last, enjoy an evening of undisturbed and well-deserved rest. Instead, after placing his luggage in the simple room, St. Raphael went out to roam the dark streets, hoping to discover even one Orthodox Christian to whom he could minister. After several hours and numerous inquiries, he happened upon a handful of young Orthodox Arabs and joyfully spent the entire night and early morning hours comforting them in their loneliness, offering them fatherly counsel and advice, instructing and encouraging them in the faith, and hearing their confessions. Only at the last moment did he reluctantly leave their company in order to rush back to the hotel, retrieve his suitcases and hurry to his train. Out of breath, he arrived at the station in time to board the train as it pulled away from the platform. But before he closed his eyes to steal a few minutes of rest on the crowded and noisy train, St. Raphael carefully inscribed in his notebook the names and addresses of his new-found spiritual children, placing next to each a notation of what he promised to send — to one a prayer book, to another an icon, to yet another a prayer rope, and, to all, assurance of his paternal love, prayers and blessings. The sacred relics of St. Raphael, "the good shepherd of the lost sheep in North America," were first interred in a crypt beneath the holy table at his St. Nicholas Cathedral in Brooklyn, New York (March 7, 1915), later interred in the Syrian Section of Brooklyn's Mt. Olivet Cemetery (April 2, 1922), and finally translated to Holy Resurrection Cemetery at the Antiochian Village near Ligonier, Pennsylvania (August 15, 1988). His sanctity was officially proclaimed by the Holy Synod of the Orthodox Church in America on March 29, 2000, and his glorification will be celebrated on May 29, 2000, at St. Tikhon's Monastery. This article originally appeared in the May 2000 issue of The Word Magazine.